A beautiful flowering ornamental perfect for any landscape, the purple leaf sand cherry can be either a medium-size shrub or a small tree. It is often chosen for its purple foliage, which will grace your yard from early spring through autumn when the leaves turn a stunning bronze-green. This is a relatively easy plant to grow in most zones and is pretty good at adapting to soil and sun conditions. It's certainly one to consider if you're looking to add a splash of color to your landscape. The botanical name of this shrub is Prunus x cistena. 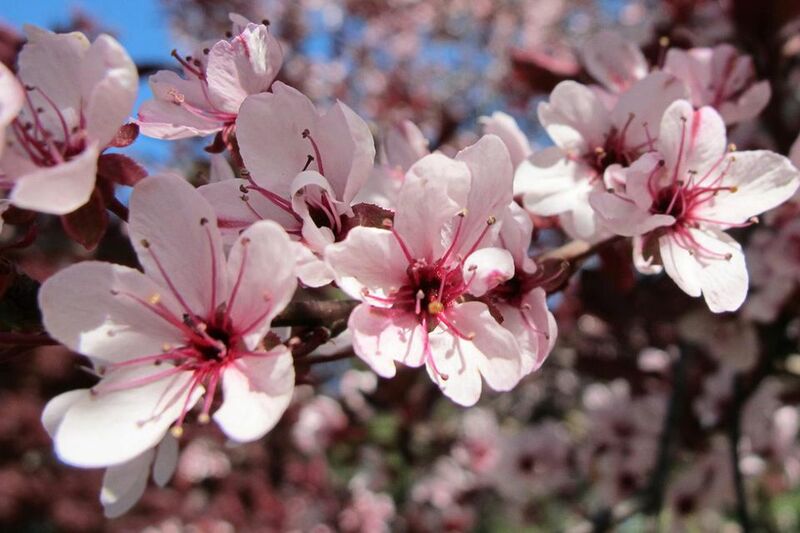 Prunus is Latin for "plum," while cistena is the Sioux for "baby," referring to its dwarf size. The x indicates that it is a hybrid. It was derived from Prunus cerasifera (purple leaf plum) and Prunus pumila (sand cherry). The sand cherry is a member of the Rosaceae family, so it is related to roses. Many of the common names for the purple leaf sand cherry are simply different compounds of the four words. You might see it called the purpleleaf sandcherry, purple leaf sandcherry, or purpleleaf sand cherry. The preferred zones for Prunus x cistena are zones 2 through 8. It is a rather hardy plant and can generally survive harsh winters and summers. The purple leaf sand cherry grows 7 to 10 feet tall and wide, making it a nice, medium-size shrub or tree. When it is young, it has an oval shape. As it reaches maturity it will arch and open in the center, if it is not pruned. Purple leaf sand cherry should be grown in full to part sun. If it receives too much shade, the leaves will change to a bronze-green color. The oval leaves are a reddish-purple color and grow up to 2 inches long. In fall, they will turn a bronze-green. The flowers are pink or white and appear in April. This is about the same time that the foliage gets really colorful. In July, you will see a few 3/4-inch purplish-black drupes (fruit). Use Prunus x cistena as a specimen to provide splashes of purple in the garden. You can also have fun shaping it. With careful pruning, it can even be used to create a fantastic semi-formal hedge. Purple leaf sand cherry is very susceptible to pests and diseases, though it is a good choice for drought-resistant gardens. On average, you can plan on a lifespan of approximately 10 to 15 years. The small fruits will attract a great variety of birds, making it an excellent plant for bird watchers. Purple leaf sand cherry can grow in a wide variety of soils and conditions. It does prefer a well-drained soil but is usually good about adapting to other types. The stems will be red-brown to dark gray and tend to ooze sap. This is particularly noticeable if the plant develops fissures or cankers. Also, keep an eye on the roots because they are close to the surface. If they are damaged, the shrub will be forced to send up suckers. Propagation of the purple leaf sand cherry is relatively easy using stem cuttings. Pruning on Prunus x cistena should be done after the flowers come in spring. Prune it as needed to keep it in an oval shape or it will begin to spread and open in the center as it matures. Unfortunately, Japanese beetles are very fond of the purple leaf sand cherry. Other pests include the peachtree borer, scale, fall webworm, aphids, mealy bugs, and tent caterpillars. Common diseases include honey fungus, verticillium wilt, black knot, cankers, powdery mildew, leaf spot, and bacterial leaf scorch. The branches are prone to frost cracks. Does the Big Leaf Maple Tree Actually Live Up to Its Name?